From barbeques to social gatherings and parties, to evenings spent watching the stars, a custom designed and built deck and patio can complement your home life and provide the outdoor gathering place you have always wanted. 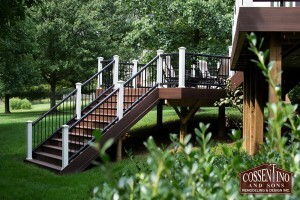 Cossentino has designed and built hundreds of decks for our customers across Maryland. We realize that a deck is much more than a porch, it can provide you, your family, and friends with a place to relax. In addition to giving you added space, a deck adds value to any home. We begin each project with a face-to-face meeting so we can discuss your vision. This also gives us the opportunity to discuss budgets and timetables. After this meeting, we will provide you with an accurate proposal. If the numbers work in your budget, a detailed Contract Proposal and designs are provided so that you will see first-hand how we envision your brand new custom deck. Thanks to our decades of experience, Cossentino can add practically anything to your deck, including multiple levels, benches, flower boxes, and lighting. We will recommend the right types of materials for your brand new deck, while staying mindful of your budget. Our crew of long-time employees prepares the area before beginning the project – and keeps it clean and organized throughout the building process. When the deck is complete, we make sure to remove any leftover building materials and debris. 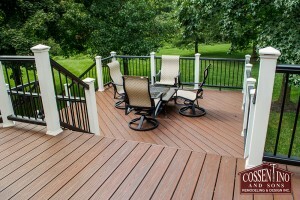 Cossentino has custom decks, many with patios, and custom Trex decks to rave reviews for years. Just wait to see what we can do for you. Cossentino and Sons is based in Howard County and we service customers in Baltimore, Carroll, and Anne Arundel counties, along with parts of Northern Montgomery County. If you want a brand new deck, and are interested in working with experienced professionals who pay attention to detail, contact us today at (410) 442-0000 or email us today.